Copycat Starbucks Gingerbread ~ skip the trip to the pricey coffee shop and make your own moist and perfectly spiced frosted gingerbread. I got a sudden craving for Starbucks Gingerbread the other day, but I was way too busy to stand on one of their famous lines, and anyway, it’s been pouring buckets here in California, and I just blow-dried my hair… so there was no way I was going out in that. I wish they’d get that whole drone thing figured out soon, it would really help. But you probably already figured out that this story has a happy ending My copycat version is divine. 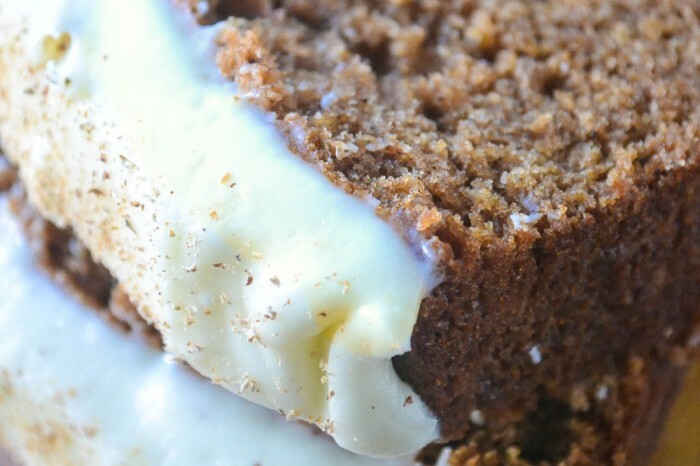 It’s everything you dream of in a gingerbread, plus a heaping layer of cream cheese frosting. I say copycat, but in truth, it’s much much better than anything you could buy. The spicing is fresh and rich, the cake itself is extra moist, and the top heavy load of frosting makes it decadent and a little quirky. Definitely not mass produced. And it gets even better after a night in the fridge, so it’s pretty perfect for Christmas morning. This recipe has been floating around the Internet for some time, and it’s really very good. It has a similar texture to my SPICED APPLE CAKE, probably because both recipes rely on fruit puree to create an extra moist crumb. 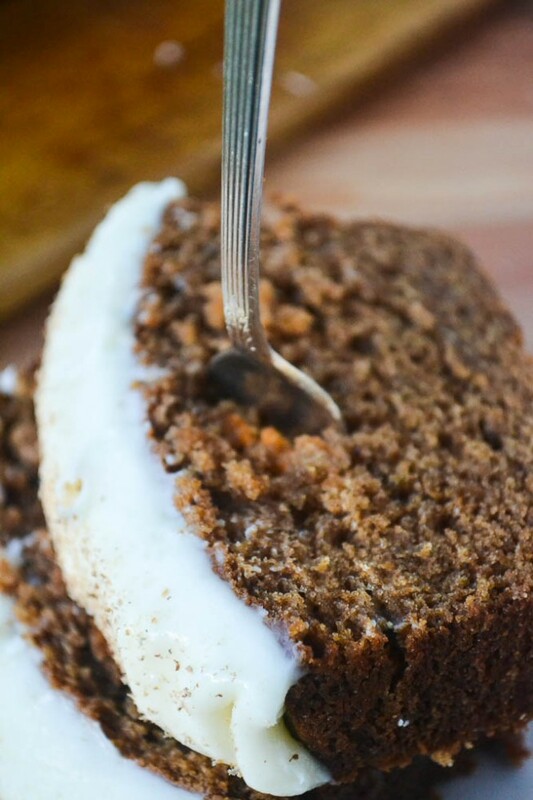 The spice cake uses apple butter, and this recipe calls for applesauce, but I didn’t have any, and because of all that rain, I raided my cabinets for an alternative. I came up with a can of pears, which I drained and pureed in my little food processor…I think it was an inspired choice. The frosting needs no introduction. It’s a classic cream cheese, dusted with some freshly grated nutmeg. Have I sung the praises of fresh nutmeg enough? I probably have, but I’ll do it again in case some of you are new ;) I ONLY buy whole nutmeg, never the ground stuff. I use a simple microplane grater to shave off just what I need. The flavor and the scent is out of this world. Taste it in your mind’s eye…I know you can. You will love this, I have no doubt. Make it with confidence for company. It’s that good. One warning — I don’t think this would be ideal to wrap and give as a gift because all that cream cheese frosting stays relatively soft. I think it would get messed up, just saying. But that’s just all the more reason to treat yourself. Add crystallized ginger to the bread, and sprinkle more on top of the frosting.. 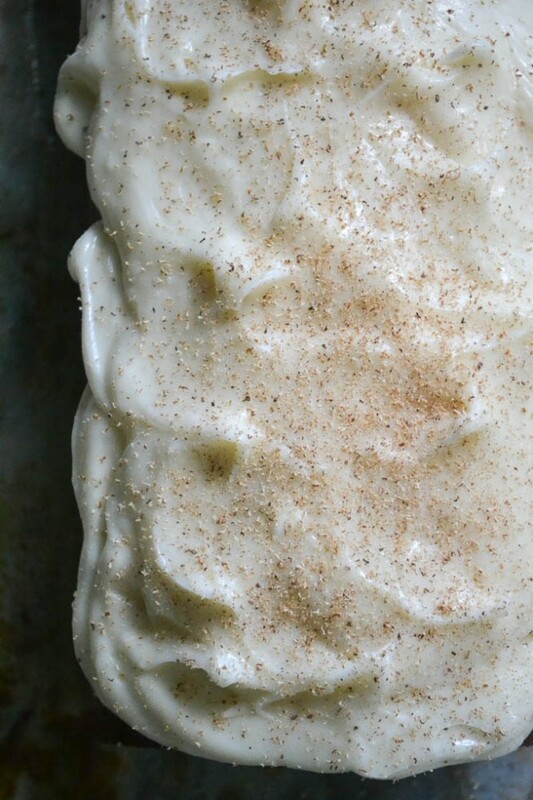 If you love gingerbread spices, try this Easy Gingerbread Fudge, or this Gingerbread ice Cream! 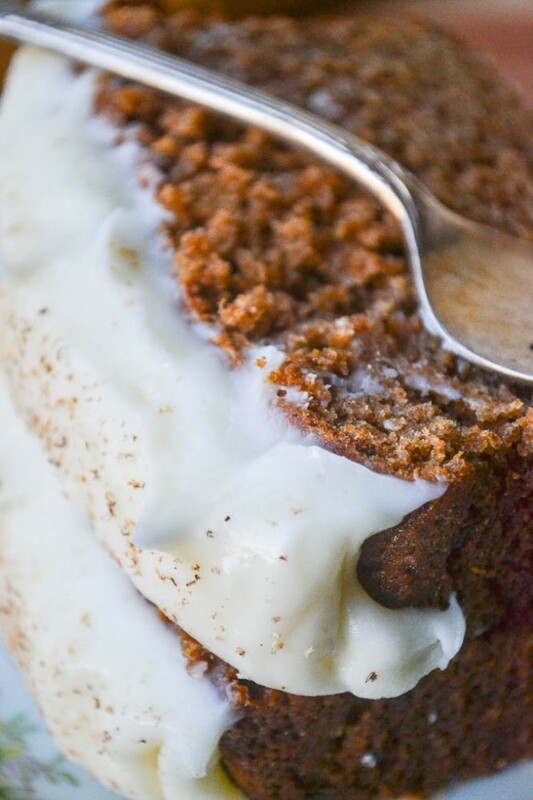 If you eat low carb and keto, try this Low Carb Gingerbread Cake Roll. 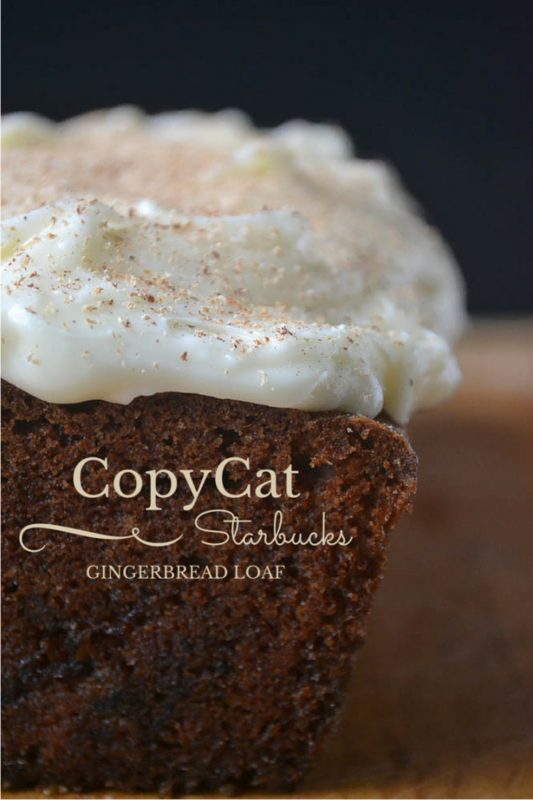 Don’t forget to Pin this CopyCat Starbucks Gingerbread Loaf! Oh My Goodness – this is truly the BEST Gingerbread I EVER tasted!! This was fabulous. Will be making this again very soon. This recipe is amazing! I’ve never had the Starbucks version, but this was SO delicious. Hi there. I loved the flavours in this – but mine didn’t rise, and actually sank in the middle. Should there have been baking powder in the recipe? I’m not sure what might have happened to cause that, is it possible it wasn’t cooked in the middle? It says 11/2 cups of flour – don’t understand??? That’s 1 and 1/2 cups. For how long do you bake it for? you put the temperature of the oven only. The recipe says to cook for 55 minutes, Danielle. I always like to take a peek earlier just in case the oven is running hotter than expected. You are AMAIZING thank you for all the recipes and the effort you do it for us . I made The Gingerbread Loaf was Delicious my Family loves and I can’t said is a Copycat because and my opinion is better then Starbucks. 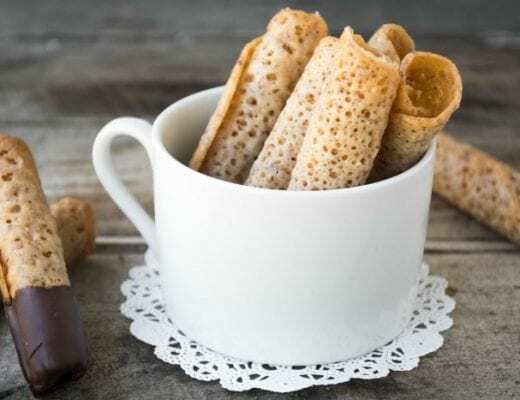 Have you ever used some brown sugar or molasses? 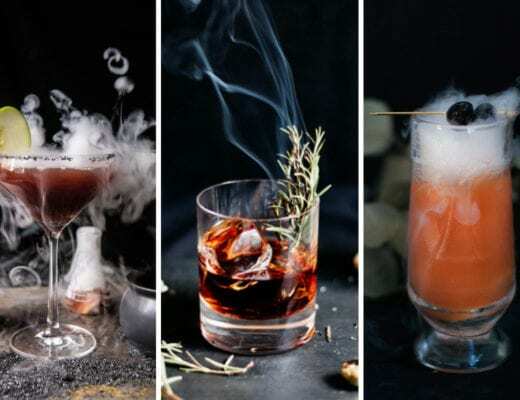 This particular recipe doesn’t call for it, but I think it’s worth experimenting with Mary. I make one version of gingerbread with Black Strap and dark brown sugar. This was so delicious! But it didn’t taste like gingerbread to me. And it wasn’t even close to being that rich brown gingerbread color. It looked and tasted more like a spice cake. I’m definitely going to continue to make it even though I didn’t get gingerbread out of it! Did you use the full amounts of spices, Kristina? They really make a difference, especially the tsp of cloves. You might try adding some molasses next time, substitute a tablespoon for a small amount of the applesauce. Could I use a bundt pan instead of a loaf pan? I don’t think there would be enough batter, Sara. I do plan to do a gingerbread bundt cake next fall, so keep an eye out for that. But in the meantime, you’d have to experiment with doubling the recipe. Good luck! 1.) What is crystalline ginger? And how would you sub into the cake part? 2.) how would you sub in the molasses? what would you take out…or how much would you put in. Crystalline ginger is candied ginger, Sherry. You can put it in the cake if you like, or scatter it on top. I haven’t made this with molasses so I think you’d have to experiment. You might try replacing some of the applesauce for starters, maybe 1/4 cup. What can I use in place of applesauce and pear.maybe buttermilk? I can’t say for sure, because I haven’t tried, but it might work to use buttermilk and maybe some molasses. Starbucks uses crystalized ginger. I have not found any counterfeit recipe that makes it that way. I didn’t use that because I personally don’t like it, but I think you could add it in to this recipe, either in the cake part, or as a garnish on top. 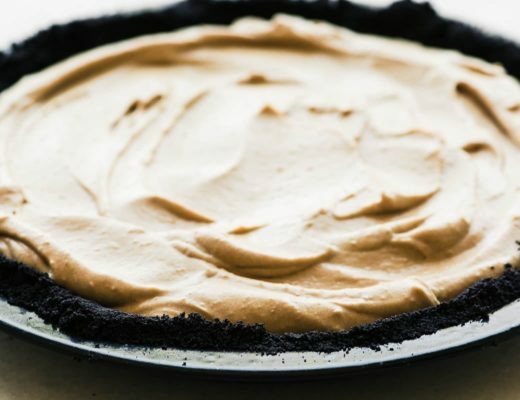 This looks so good, but Im wondering how did you get it so dark without molasses or brown sugar? Is it dark from the cloves? Just wondering becasue I love starbucks version but would love to try making my own. Thanks! You know, several people have asked that, and I think it must have been the spices…cloves are very dark and do color a batter. I may try a variation of this with molasses, though. Made this, but with an orange glaze instead of the frosting, for a charity bake sale. Everybody loved it but one comment summed it up perfectly. Emily said “That’s the best ginger cake I have ever tasted”. I couldn’t agree more. Thanks for this recipe, I love it. I’ll do the frosting next time. Oh I’m so glad to hear that Jeff! It’s been a while since I’ve made this one, now you’ve got me craving it. Your orange glaze is an interesting variation. It can stay out for a day, but after that I would probably wrap and refrigerate, Dawn. Can this be made as a cake in a jar like banana bread cake?? I honestly don’t know, Jacqueline, but it might be worth a try. Is there really no brown sugar or molasses in this recipe? I thought all gingerbread had one or both items? this only makes 1 loaf ? I clicked on the link to find “these will quickly become your family’s favorite holiday cookies – – they melt in your mouth,” but I cannot find them on the Pinterest link they took me to. Any hints? Thanks. 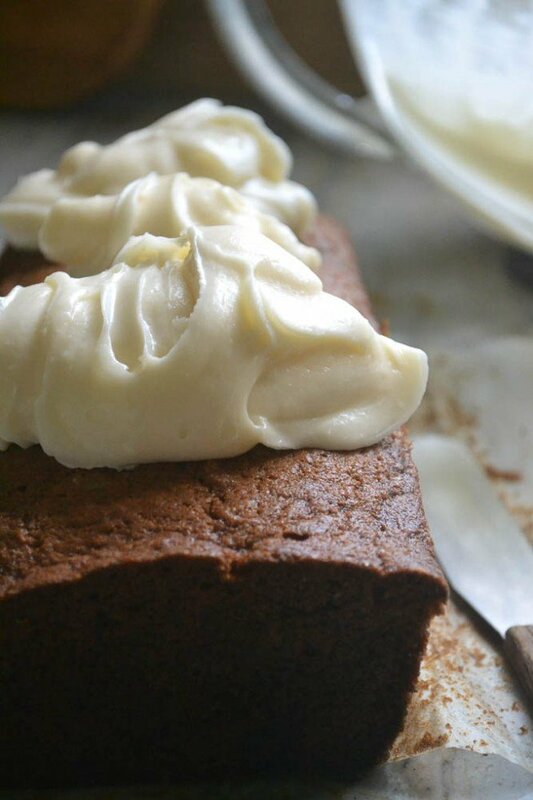 Gorgeous gingerbread and that frosting is absolute perfection! Looks great, and I have to say I made your microwave peanut brittle last night and it’s the best I’ve ever had! You were right, it was very easy as well. I bought raw Spanish peanuts and just roasted them myself before putting them into the brittle. Thank you! Printing now! I made gingerbread cupcakes for my next post – if I can ever get it written – haha. Love this recipe – and will probably make it for Christmas. Thanks Sue! I think you’ll like it, Tricia, I’m going to make it for my girls when they get here. I look forward to your cupcakes! I have to admit I’ve never had Starbucks Gingerbread but this looks wonderful and I’d much rather have homemade than stand in a line any day! Sheesh, I know California has been in a drought but that’s a lot of rain you’ve had. Gingerbread is my favourite this time of year! I’ve never had Starbuck’s version, but this one looks absolutely delicious. Must bake this up this week to enjoy over the holidays. So true :) Have a great one, Gregg! This will be going to my husband’s work potluck next week after I try one for at home first :) Did you use a standard size can of pears? Thanks for sharing. Ooop, no, a 15 oz can, I’ll update that, thanks Sharon! Sigh. All I can say, Sue, is that I wish you were my next door neighbor. Me too, Amy — I seriously need takers for some of this stuff, this one was dangerous to have around. Oh, yum. It’s like Santa’s kitchen over here, Sue. I think I’ll try this Thursday or Friday. We have 3 holiday potlucks this week, and this would be perfect to bring along. I know you’ll love this Elizabeth, I think I’m going to make it on Christmas Eve for us to have in the morning. Have a wonderful week!